Flowers Aberdeen provide flowers for every occasion and purple flowers are a wonderful option to send to someone you love, for a birthday, anniversary or just because. You’ll be spoilt for choice here at Flowers Aberdeen as our range of flowers is so wide that there is always something to suit your taste. Your recipients will be delighted to receive our beautiful Flowers Aberdeen arrangements which are always made from the best quality flowers which we have imported to us directly from Holland where they are cultivated. Bringing you beautiful flowers for every occasion is a joy and delight for our Florists Aberdeen who are all passionate about flowers and creating gorgeous arrangements. At Flowers Aberdeen we make sure that our first priority is always customer satisfaction so that you’re guaranteed to be delighted with whatever you order from us and for whatever reason. The Flowers Aberdeen delivery service means that even if you’re busy with something you’ll still find it easy to organise for wonderful gifts to be delivered to your loved ones as you can order online or over the phone, whatever suits you best. We aim to provide a service that will be convenient for you here at Flowers Aberdeen as we know how important it is to be able to send beautiful and thoughtful gifts throughout the year. Flowers Aberdeen deliver six days a week throughout the UK thanks to our network of trusted florists. We can even have your Flowers Aberdeen arrangements delivered further afield in over 140 countries internationally. 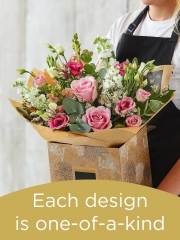 When it comes to flowers you can trust our Florists Aberdeen to provide you with the service you need to be able to send gifts to your loved ones no matter where you find yourself in the world. Flowers Aberdeen will be delighted to deliver your flowers wherever they need to go on your behalf. As well as flowers our Florists Aberdeen can deliver a number of gift items to your recipients. These can be sent with your Flowers Aberdeen arrangements or even on their own as we always want to make sure our service suits you and your needs. We can deliver gift items like champagnes, chocolates, teddies and balloons which all make wonderful gifts and will be delivered right to your recipient’s door with the Flowers Aberdeen service. Flowers Aberdeen also offer plants which can make a great alternative to flowers as they are longer lasting and for some people make the perfect gift. There are so many options available at Flowers Aberdeen as we always want to offer something that will appeal to you. Everything is made so easy for you when you order from Flowers Aberdeen as you know that from the moment your order is placed everything is in our very safe hands and there’s nothing more for you to worry about. We take care of everything for you at Flowers Aberdeen right up until the moment your arrangements and gifts are delivered safely into your recipients’ hands. Whatever you need you can be sure that at Flowers Aberdeen we’ll go to every effort to ensure that it’s provided for you and arrives in the perfect condition we know you expect from us. Flowers Aberdeen have been providing Aberdeen and the North East with gorgeous flower arrangements for over 40 years and we’re very proud of the service we offer. Everyone in the Flowers Aberdeen team wants to make sure that your order is carried out exactly to your requirements as we love bringing smiles to faces and brightening up people’s days. For any further information don’t hesitate to contact Flowers Aberdeen.